Budget planning is essential if you want to get your expenses under control and free your mind for other things. You probably already know that, but the hardest part is the implementation. To get started, we recommend you a few expense trackers apps for your iPhone/iPad that will serve you tracking and managing your expenses. Many of them are so easy to use that eventually you will not even realize you’re using them. They will help you plan ahead, avoid costs and complications of missed payments, and see where you are spending money needlessly. The XpenseTracker App allows you to manage your expenses for personal or business use efficiently. It has customizable categories/sub-categories and payment modes to ease your job. You can sort as you like depending on your need according to payment type, category, client or expenses by date. XpenseTracker is excellent at tracking your expenses as it also tracks your mileage as well, so when the tax time comes along, reporting your mileage is easy too. The app also records last payment type for all categories, and it also supports all major currencies. Spendee is another application similar to the above, trying to stand out from the rest by showing a detailed interface that is also easy to understand. 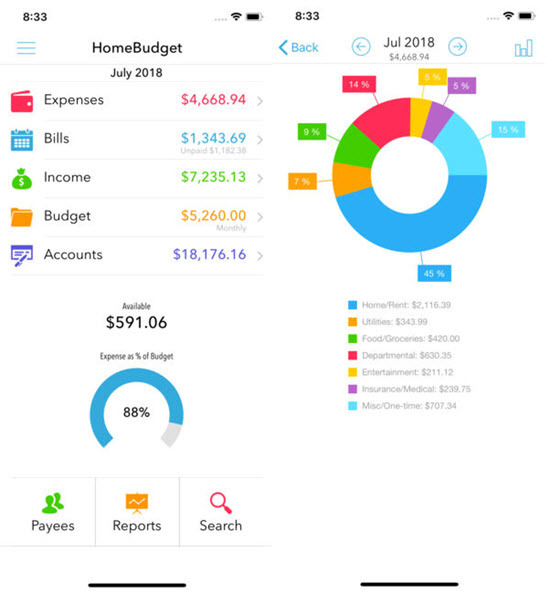 This app shows your income and expenses in different colours depending on your type, sets objectives to save the amount, and includes social and location functions to add even more information to the records of your movements. 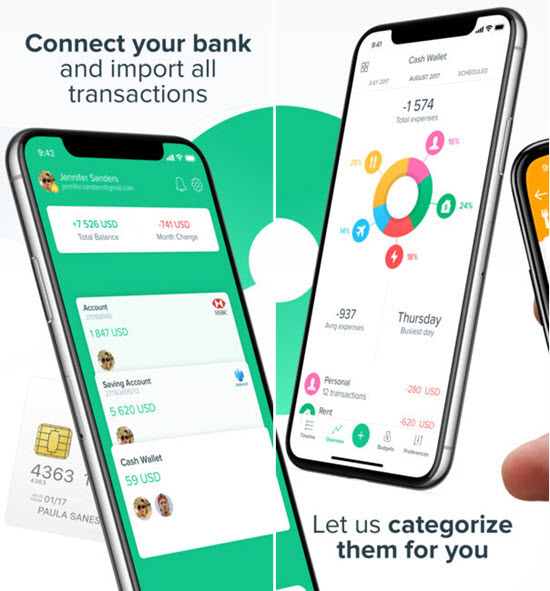 Spendee app offers the superior support of multiple currencies, PIN protection, account syncing, listing of receipts and even a custom wallet for special events to track all your expenses. This is an excellent expense tracker app to organize personal finances for free exclusively for iOS. This app design makes it one of the most compelling applications for Apple users. It allows to organize your expenses by categories, and sends daily, weekly, monthly or annual summaries offering a quick interpretation of the expenses. You can protect your account with a password and set customized reminders for tracking your bills and pay securely through the app. It also supports multiple payments for a single bill. 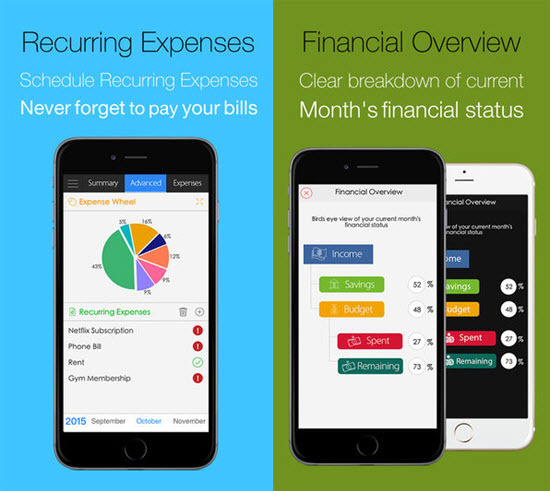 With this free expense app, iOS users will be able to organise their daily expenses. Based on the Phone calendar, it allows you to enter an initial budget; As the daily expenses are recorded, the money is deducted. 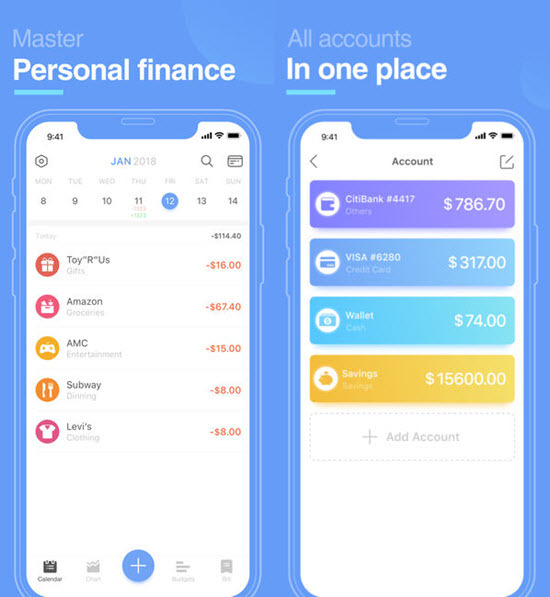 The budget app mentioned here is the offline-only version of DollarBird for iPhone, the same app for daily expense tracking for iPhone user. If you need the new cloud-base version, search “DollarBird” in the App Store instead. Both of them have high ratings from their users. To be even more organised, this app offers you the possibility of creating different labels (Food, Debt, Rent, Leisure, etc. ), so that at the end of the month you will have a more precise analysis of what you spent money on. Live Expenses helps to optimise control overall expenses that are generated every day. One of its primary features is to use both personally and professionally, as it allows you to attach images that justify how each of your expenses was generated. The application is very intuitive and allows you to register your expenses quickly by adding categories. Afterwards these will be shown in graphics, and the app will also allow you to schedule periodic reports, make budgets and even save backup copies. The app also supports the use of foreign currencies and the exchange rates as well. Visual Budget helps you handle your personal and business accounts using advanced analysis and consolidation features. It can handle several accounts together and classify them into separate groups. You can modify category list as you want for each of your accounts, which are automatically created based on a standard model. And there will be two levels of categories/sub-categories to set your budget plan easily. 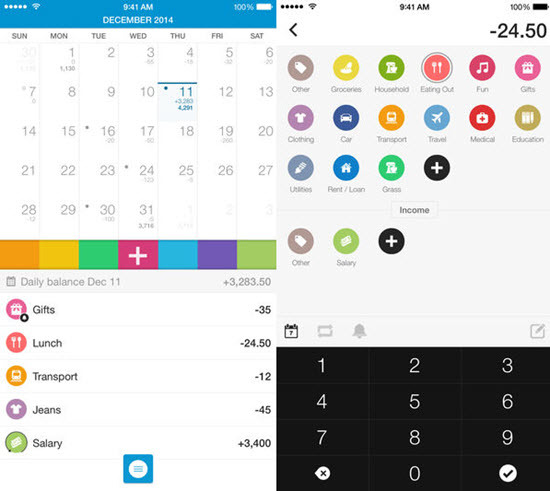 To get started, add all your expenses and income to track your daily spending. This app offers you all the information on the expenditure of your finances with detailed data and easy-to-understand graphics so you can know where your money in and out. 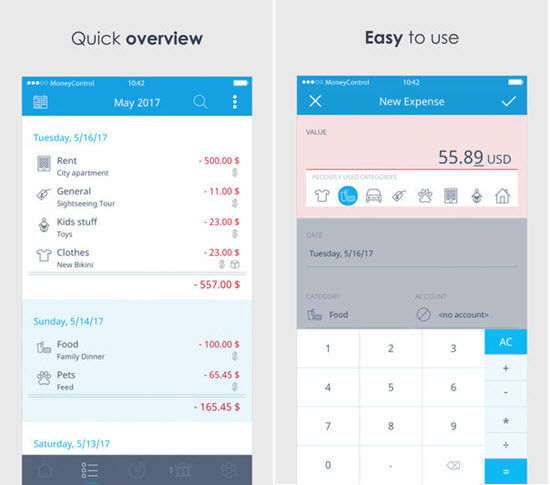 Money Control is perhaps the most impressive personal app for finance on iPhone/iPad. Since it has an option of synchronising all your data with Dropbox, you can easily access on the go. The system is simple, and it has a separate in-app purchase saves you from the sea of receipts, by just clicking a photo of your records and then adding it. 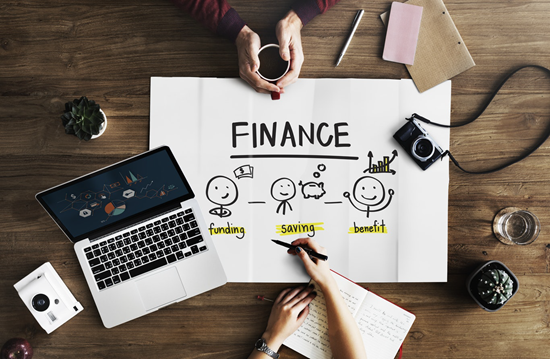 Like other applications, you can also adjust budgets as needed, which will send alerts at excessive spending, as well as being able to schedule transactions, add labels to expenses, etc. HomeBudget app provides a combined set of options to help you manage your cash flow and expenses. You can set reminders for due dates and make payment on bills either as a transfer or an expense and bill list. This app is well-built and easy to use. The categories can be easily adapted to the needs of users. 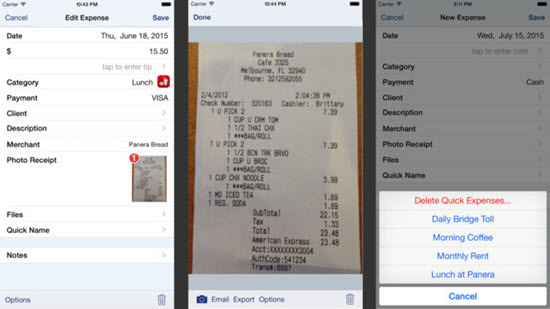 You can also set a budget frame for each category and can attach images of receipts. Multiple currencies and automatic exchange rate conversion support let you handle your foreign funds. Price: $4.99. Offering Lite version for free (20 expense entries & 10 income entries limited). Thanks to its minimalist interface that allows quick access to all its functions. 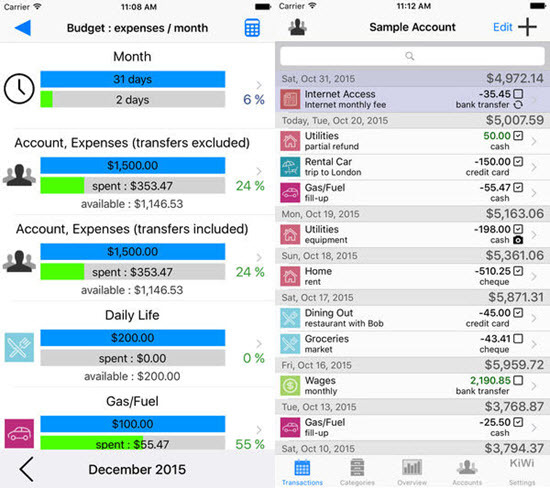 Next is considered one of the best budget apps for iOS. Its main characteristics do not differ from those offered by any of the applications mentioned above, although one of its disadvantages is that it does not allow adding revenue but only records the expenses that are generated in a month. 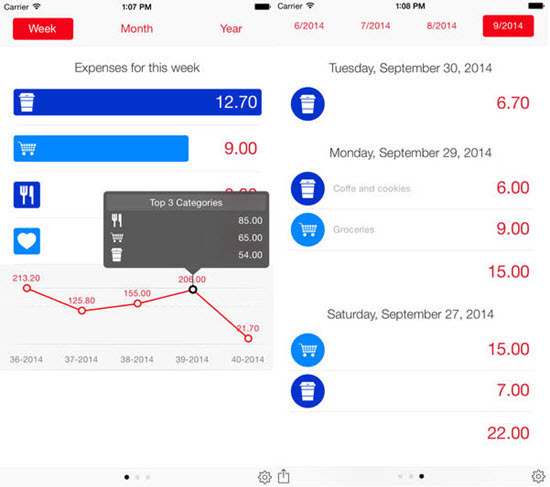 You can access your expenses and stats in multiple screens via swipe. Sync your data with iCloud not only for protection but also for easily accessing your data from other devices. Also, you can export your data to an Excel sheet. Expense Tracker 2.0 app intends mainly for today’s busy individuals to get control of their expenses. It has an inbuilt financial and budgeting assistant which helps you to handle your finances at your fingerprints and gives some advice on saving money. The app is secured through passcode or Touch ID. You will be informed of your financial report every month, with scheduled expenses such as renting house, paying bills for telephone, or any other recurring expense, etc. Hence at the end of a month you have a more specific analysis of what you spent more money on. These are the best expense tracker apps for iPhone so that you can take all your finances in order. Though each app has pros and cons, choose the best one suit you most to easily and quickly control all your personal expenses and your home economics or even keep your business accounts with these incredible applications. Some of them may offer the option to track your receipts. If not, you can get this list of the best receipt tracking apps for iPhone to get a great control over your money.